The purpose of a knee replacement is to relive pain and allow patients to return to normal activities such as walking that were limited / prevented previously due to pain. 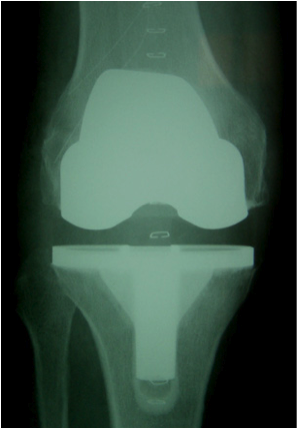 A total knee replacement is an effective way of relieving the pain of an arthritic knee. The replacement is actually a resurfacing of the worn out joint surfaces with artificial surfaces comprising a metal shell coating the ends of the femur and tibia with a high density polyethylene bearing in between. By removing the worn out joint surfaces of bone the source of the pain is removed. Some patients develop a deformity / bend as a result of their arthritis. Any such deformity can be corrected as part of the knee replacement operation. Modern knee replacements have been evolving over the last 30 to 40 years and are now very effective at relieving pain and improving function and as long-lasting as hip replacements. Arthritis can be diagnosed from plain x-rays. However, on occasions it may be necessary to obtain detailed information on the knee prior to surgery and therefore you may be asked to attend for an MRI or CT scan. The operation involves an incision over the front of the knee. The patella (Kneecap) and muscles attached to it are moved out of the way to expose the joint surfaces. The worn out bearing surfaces of the knee are resurfaced with metal implants and a polyethylene lining is inserted to separate the 2 metal components and provide a low friction bearing surface. As little bone as possible is removed to allow an implant that closely matches the size and shape of the patient’s bones to fit accurately. If the knee has become deformed as arthritis has developed then the bones are cut in a way to correct this deformity, making the knee straight again. Most patients remain in hospital for up to three or four days but there is no fixed limit and patients can go home as soon as they can walk safely with elbow crutches and manage whatever tasks they need to perform at home. Overall more than 90% of patients are happy with the result of their knee replacement. The length of time a knee replacement will last in any one individual is very difficult to predict but a good analogy is that of asking how long a new car will last and of course this depends on how far you go and how well you drive it!